It's been 1,000 years (approximately 5 months) since my last round of Splurge or Save, so why not start up again in 2016? I've been keeping an eye on one of the coolest trends at the moment: the ever so coveted bucket bag. They're cool. They're shaped weird. They're versatile. Did I mention that they're cool? Did you choose? Something terrible will happen if you look at the answer without making a guess first. You'll spill coffee all over your dress two minutes after stepping into the office or something equally as life-altering & horrifying. Okay well here's the answer: the $335 bucket bag is on the left, the $65 one on the right. How did you do? 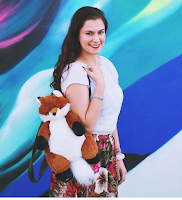 Made of leather (blech), the Rachael Ruddick Beach Bucket Bag comes with pretty features like a drawstring closure & adjustable cross body strap. The dainty blush pink hue reminds me of a big batch of sweet, sweet cotton candy. The bag retails for 335 bones. Then we have the Neiman Marcus Metallic-Trim Faux-Leather Bucket Bag made from faux-leather (polyurethane). The cute golden hardware adds a funky feminine touch. Details include a removable flat top handle, adjustable shoulder strap, drop drawstring top closure, & metallic lining. Although I prefer the overall sheen & texture of the Rachael Ruddick bucket bag, I enjoy the charming gold bits & adaptable nature of the Neiman Marcus one. Of course, as a vegetarian, I would never purchase the Rachael Ruddick bag due too its being made with leather. The struggle. 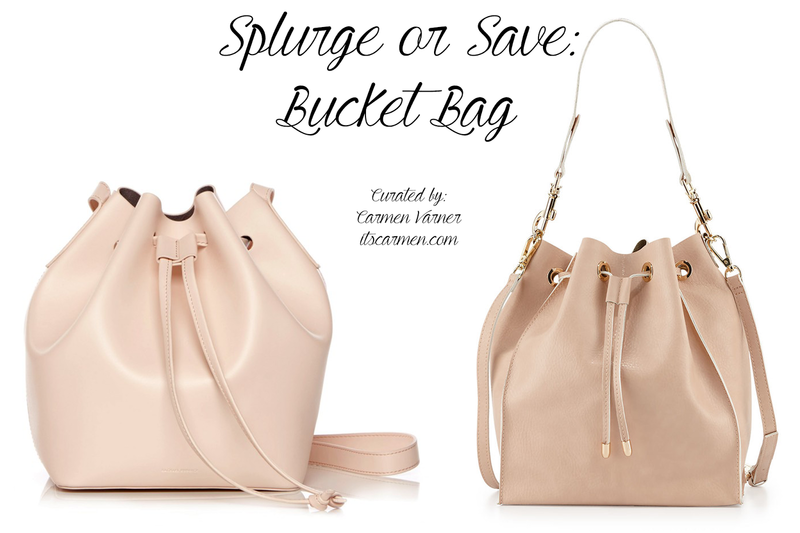 For this round of Splurge or Save, my vote would definitely be for the Neiman Marcus blush bucket bag. How about you? while I love the look of a bucket bag, I can't carry one. They can never fit all that I carry. haha clearly I carry way too much stuff with me. Love posts like this! I'm all about both bucket bags. Cute post! I guessed right, but actually think I prefer the look of the Neiman Marcus one! I completely agree that the gold hardware adds a little extra to the style. Both are great picks for spring though, I really like the style of bucket bags for something a little different! I love that you had us guess which one we thought was the splurge and save!! Dang, I chose the expensive one. #Typical Haha. I definitely guessed wrong! But both are really cute so I would def go for the cheaper option! sometimes you can go on a bit of splurge, and that bag is SO worth it. gorgeous! I guessed right, yay! Also I´m with you on save side. I just love the gold details. I think they make the bag look a bit more special which is something I look for in my accessories. I felt the one on the left was the splurge choice, but I still like the one on the right better! Great find! I definitely prefer to save especially on bags!! They're just so crazy expensive and I would rather have options than putting all my money into one! Love this post idea! I like the look of the leather one just a litttttle more but the material and color of the faux-leather better. What a steal! Gorgeous bags! I love the bucket silhouette! I actually prefer the details of the less expensive one - go figure! Great picks lady! Love these bags! Looks so cute! Wow, I definitely thought the one on the right was the more expensive one. I'm sure they look different in person but it still says something that between the two I'd prefer the one that's cheaper. i think both are pretty! although the more expensive one does look more edgy as it has minimal lining which highlights the beautiful texture of a bucket bag.